Welcome to Amc Ozone Treatment. We are the Australian pioneers of harnessing the natural purification power of Ozone for mould elimination! Please be advised that our office will be closing to celebrate both Easter Weekend and ANZAC Day. Our office will be closed on Friday 19th of April 2019 and will re-open for business on Monday 29th April 2019. We wish you and your families a safe and happy Easter and Anzac day. We offer mould treatment & removal in Brisbane, Gold Coast and beyond. Our rates are competitively priced to enable everyone access to a safe, healthy home or office environment. All other areas will be priced per application. IT'S ALL ABOUT OUR RESULTS! Ozone is the strongest commercial sterilant in the world, leaving no toxic residue, reverting back to Oxygen (O2) once treatment has finished. Thats right - Contaminant-free, Pure Fresh Air! Ozone is 3000 times stronger than any chlorine (Chemical) product on the market today. Having an ozone treatment in your home is an effective way for lasting results to kill mould, bacteria, germs and viruses. It also removes smoke and pet odours. Our Home including bathroom mould treatment & removal is one of the best long term solutions, far more effective than a quick fix or temporary bleach and chemical formulas. Ozone is nature’s own purifier. Just like when a thunder storm and lighting strikes, you can smell the purity of ozone in the air. Do you have allergies to mould and dust mites? What about viruses and bacteria that you can't see or smell, such as e coli, salmonella and staph? If you want to eliminate these from your environment, creating a healthier home for you and your family, then mould removal by AMC Ozone is your answer. We’re the indoor air purifying specialists. O2 is turned into O3 in the generator, then pumped into the room. The third atom of the O3 gas splits off and attaches to the airborne offending organisims, oxidising and destroying them by breaking them completely down. Our ozone generators produce zero nitrous oxide, leaving no toxic residue behind after the mould removal treatment is complete. 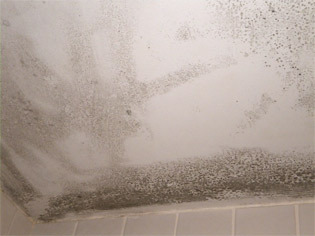 Mould needs just three things to grow: moisture, a nutrient, and a warm environment. This is why cleaning with bleach is just a temporary solution. Once the moisture and heat return, it will start growing again. Toxic spores begin to multiply very quickly, infecting everything in their surrounds. Approximately 15,000 spores are equivalent to the size of a pin head. It will contaminate contents (furniture, clothes, food, paper etc). These items also act as food for spores, but even worse they are extremely harmful to your health. Our company will guide you through the correct remediation processes which are set out in the Australian Mould Guidelines. Q. Is it the same room? A. Yes it is - bathroom ceiling, Southport (Gold Coast). 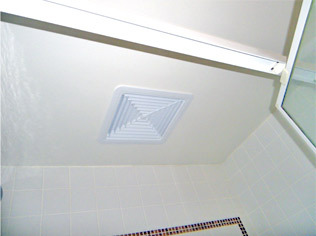 Lack of ventilation caused this problem, but our bathroom mould removal service eliminated it. Ozone kills mould on contact, even the loose spores you cannot see and in places you cannot see in the home. If untreated, it can gradually destroy the surfaces they are growing on, rendering them unusable. If mould removal is not carried out correctly it is likely to cross contaminate. Ozone is the strongest commercial sterilant in the world. It is 3,000 times stronger the chlorine. If you have never had an ozone treatment in your home before, book one now. You will be amazed just how your home, furniture and clothes, smell and feel after an ozone treatment. Feel secure at home knowing you and your family are breathing pure fresh air. Ozone will also remove pet odours and cigarette and smoke smells. If you suspect you have a mould problem, call us now.